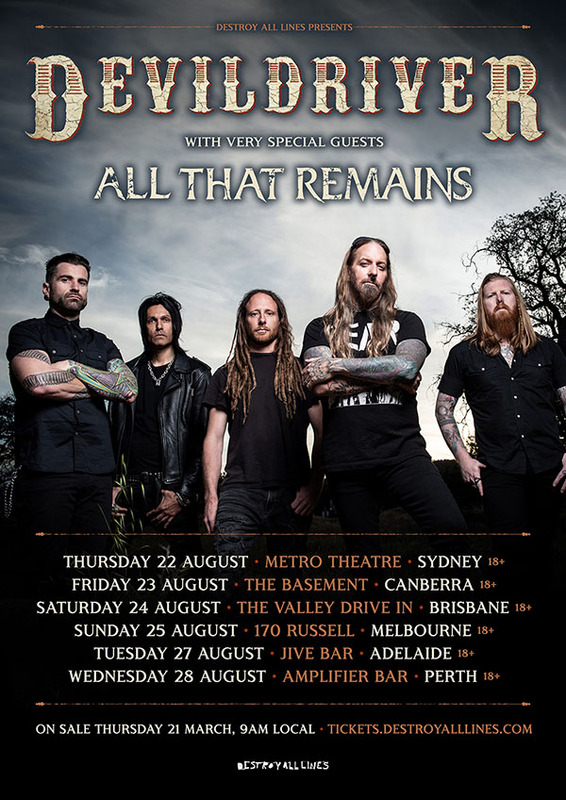 ​After what seems like an eternity, US metal icons Devildriver are finally returning to Australia to appease their rabid legions. It’s been five long years since the band last headlined here and Dez and the boys are primed and ready to make up for lost time! From the opening seconds of Hank3’s Country Heroes onward, Outlaws ‘Til The End is simply one of the most invigorating records the band have made yet. These evocative, irresistible songs have all been wholly rebuilt from the ground up, powered by the classic Devildriver sound and embellished with Fafara’s unmistakable feral roar. The critically acclaimed record is the last to feature the bands founding guitarist Oli Herbert who tragically passed away less than a month before its release. Hailed as a return to their heavier, metalcore roots, Victim sees the band focused and re-energized. Driven by pummelling drums, jackhammer guitars and chaotic screaming. It’s Damn good fun! Tickets on sale 9am Thursday 21st March.